The newly-built Moses Mabhida Stadium in Durban will host one of the semi-finals of the 2010 FIFA World Cup™. The ground epitomises the architectural innovation on display in South Africa and takes its design inspiration from the South African flag, with its grand arch representing the unity of this sport-loving nation. The two legs of the arch on the southern side of the stadium come together to form a single footing on the northern side, symbolising the new unity of a once-divided country. The 70,000-seater has been specifically designed as a multi-purpose venue and an amphitheatre complete with a cable car which ascends to a viewing platform at the top of the expansive 350m arch, a staggering 106m above the pitch. From this vantage point, visitors can experience spectacular panoramic views of the nearby shoreline and the city. The roof is attached to the arch by 95mm-diameter steel cables. Each seat of the stadium is spacious and comfortable, providing a clear line of sight to the pitch. It is a world-class and multifunctional arena located in the heart of the Kings Park Sporting Precinct. 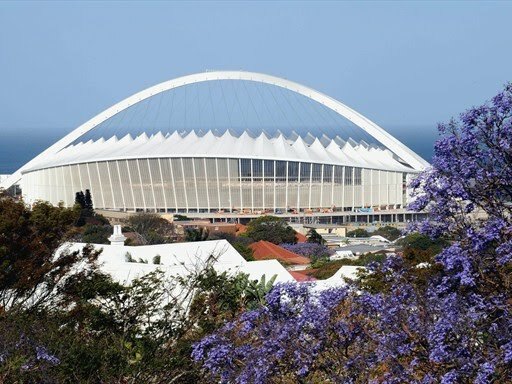 Durban’s Moses Mabhida Stadium will be the jewel in the crown of the Kings Park Sporting precinct. The entire area will feature additional sporting arenas and facilities as well as restaurants, shops, play areas for children and a pedestrian walkway linking the stadium complex to the beach. The stadium was built on the site of the old Kings Park Stadium. Moses Mabhida, the ground’s namesake, was born in Thornville near Pietermaritzburg on 14 October 1923 into a poor family who were later forced off their land. In 1963, Mabhida was asked by Oliver Tambo while working in Prague rallying support from the World Federation of Trade Unions, to come back to Africa to develop the ANC’s armed wing, Umkhonto we Sizwe (MK). He underwent military training and became the chief political instructor of new military recruits. He later served as the commander of MK.